The majority of ceasefire violations took place in the Mariupol sector, where Russia-backed militant groups made 18 attacks within two hours, six of them from heavy armor. “Hostilities started after 10 a.m. yesterday and continued till late at night. Most hostile attacks took place in Shyrokyne. Occupants were actively using mortar launchers and barrel artillery there. The situation is similar in other flashpoints – Krasnohorivka, Novotroitske and Talakivka. The armistice held in other areas,” informed spokesman of Ministry of Defense on ATO related issues Colonel Andriy Lysenko at a press briefing at Ukraine Crisis Media Center. In the Luhansk sector militants opened fire in Stanytsia Luhanska, near Shchastia, Krymske, in the Bakhmut road and near Popasna. The most intense firefights took place in Lobachevske which is located between Shchastia and Slovianoserbsk. In total, Russia-backed militants conducted eight attacks, using heavy arms in one of them. Five hostile attacks took place in the Donetsk sector. “A traditional firefight between Ukrainian troops and the enemy which continued several hours took place in the Avdiivka industrial area. Moreover, a series of hostile attacks took place at the Svitlodarsk bulge, one of them involved use of mortars, elaborated the spokesman. 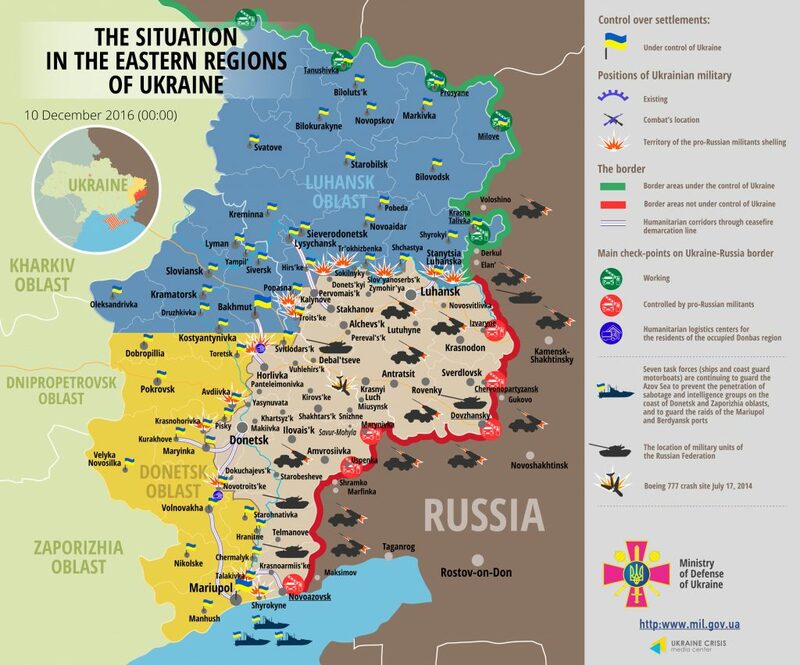 Ukrainian Armed Forces incurred no losses in combat yesterday, and one serviceman was wounded. According to the Ukrainian military intelligence, confirmed militants’ losses amount to one wounded from so-called “9th regiment”. Moreover, another batch of reinforcement for militants is reported to have arrived from Russia: four tanks were brought to Yasynuvata station. The Security Service of Ukraine (SBU) revealed a militants’ informant network in Rubizhne in Luhansk region. “The detained were collecting information for a chief of a “Cossacks” Russia-backed group. On the instruction of their curators, criminals were passing information of location and movement of military equipment and personnel of Ukrainian Armed Forces. During search conducted in informants’ place of residence, intelligence services officers seized mobile phones containing evidence of passing the information to the enemy,” said the spokesman. Moreover, former members of Russia-backed militant groups were detained in Kostiantynivka and in Mariinka district. According to law enforcement officers, the first one was guarding a checkpoint during the period of Kostiantynivka occupation and was spotting pro-Ukrainian activists. The second militant served in the ranks of “Oplot” since September 2014, where he was keeping watch at a checkpoint. “Having violated the discipline, the militant got into a solitary confinement where he was beaten and tortured. Having served his punishment, he escaped and planned to go to Russia, but was detained by Ukrainian police,” elaborated Col. Lysenko. The SBU stopped a militants financing channel functioning through IDPs social benefits in Zaporizhia. “Criminals illegally drew a package of documents to receive welfare payments for inhabitants of temporarily occupied territories who fictitiously registered as internally displaced persons (IDPs) in Zaporizhia region. The funds were cashed and taken out to the temporarily occupied territories by couriers. The organizer regularly paid the occupants interests from their illegal business,” said Col. Lysenko. Workers of a bank and a social service were engaged in the scheme,” said the spokesman. According to preliminary estimates, criminals pocketed almost UAH 12 million. Col. Lysenko also informed that three people were arrested in Lysychansk. They were trying to smuggle four grenades, about 200 cartridges of various calibers, two smoke grenades and a knife out of the frontline area. The investigation is ongoing at present.